UPDATE III: Jeb! the hypocrite, criticizing the 'free stuff' black voters get. Jeb! is/was a minority owner of the Jacksonville Jaguars, which got $121 million from the City of Jacksonville to renovate "the stadium in which the newly formed Jaguars would play football." And "while his father was in the White House, Bush was retained to help sell pumps built by a firm called Moving Water Industries. To expand its business in Nigeria, the firm relied on a $74 million loan guaranteed by the federal Export-Import Bank." Not to mention the many tax credits he gets to subsidize his wealthy lifestyle. Read the Washington Post, Jeb Bush says black voters get ‘free stuff’. So does he. UPDATE II: "$250 million in public money to [the Milwaukee Bucks for] the team’s new arena . . .
It’s another reminder that the principles of small government and fiscal responsibility that conservative politicians like Walker pledge their fealty to are highly contingent on who’s benefiting and who’s being hurt." Read the Washington Post, Scott Walker’s crony capitalism, which notes that "one of the Bucks owners, Jon Hammes, is a national finance co-chairman of Walker’s campaign and has given $150,000 to a Walker super PAC." UPDATE: Another corporate welfare queen protected by Republi-cons, the for-profit colleges industry. "A 2012 Senate investigation found that 15 of the largest for-profit colleges received 86 percent of their revenue from federal student aid programs, and spent 23 percent of their budgets, $3.7 billion dollars, on some form of recruitment. By comparison, nonprofit colleges spent less than a percent of their revenue on marketing, according to the investigation." Read the Washington Post, Slick for-profit college marketing is starting to backfire. "Americans pay nearly twice as much per pound as foreigners do for sugar, thanks to U.S. import restrictions and subsidies. . .
[Government regulations have] cost American consumers and businesses $15 billion since 2008 and 120,000 jobs since 1997." Read the Wall Street Journal, The Sugar Scandal. Republi-cons oppose welfare for poor people, but not their rich corporate benefactors. UPDATE XII: What ever happened to those preditions of hyperinflation? Read the Washington Post, And now let us remember the worst economic prediction ever. UPDATE XI: "When it comes to views on economics, Republicans have been consistent, clear and wrong." Read The New York Times, G.O.P. Monetary Madness, which notes "that hard-money doctrine and paranoia about inflation have taken over the party, even as the predicted inflation keeps failing to materialize. For example, in February, Representative Paul Ryan, who is somewhat inexplicably regarded as the party’s deep thinker on matters economic, harangued Mr. Bernanke on how terrible it is to “debase” a currency and pointed to a rise in commodity prices in late 2010 and early 2011 as evidence that inflation was finally coming. Commodity prices have plunged since then, but there is no sign that Mr. Ryan or anyone else is having second thoughts." UPDATE X: How about those invisible Republi-CON bond vigilantes. Read the Washington Post, Average rate on 30-year fixed mortgage ties low of 3.94 pct. ; 15-year also hits record. "That’s the current interest rate on 10-year US bonds. And just to be clear: this isn’t just about I-told-you-so. We’re talking about different models, different visions of how the economy works. Their vision led to calls for austerity now now now; mine said that the overwhelming danger was that we wouldn’t provide enough stimulus, and that we would pull back too soon. Sure enough, we didn’t and we did. And now catastrophe looms." Republi-cons continue to sacrifice workers to appease their imaginary inflation gods. UPDATE VII: It has been several weeks since the so-called downgrade. So how are those bond vigilantes doing? Read The New York Times, Mortgage Rates Hit 50-Year Low. UPDATE VI: "Fitch Ratings said Tuesday it will keep its rating on U.S. debt at the highest grade, AAA, and issued a 'stable' outlook, meaning it expects the rating to stay there." Read The New York Times, Fitch Ratings Keeps U.S. at Top Credit Rating. UPDATE V: "Thirty years ago, it became clear that defeating inflation was crucial, even if the means needed to accomplish that would cause a deep recession. . . . [But i]t is time for a new lesson to be learned. Sometimes we need inflation, and now is such a time. " Read The New York Times, Sometimes, Inflation Is Not Evil. UPDATE IV: "Behold the power of a stupid narrative, which seems impervious to evidence." Read The New York Times, The Downgrade Doom Loop. "[T]here is no reason to take Friday's downgrade of America seriously. These are the last people whose judgment we should trust. These problems have very little to do with short-term or even medium-term budget arithmetic. The U.S. government is having no trouble borrowing to cover its current deficit. It's true that we're building up debt, on which we'll eventually have to pay interest. But if you actually do the math, instead of intoning big numbers in your best Dr. Evil voice, you discover that even very large deficits over the next few years will have remarkably little impact on U.S. fiscal sustainability. No, what makes America look unreliable isn't budget math, it's politics. And please, let's not have the usual declarations that both sides are at fault. Our problems are almost entirely one-sided - specifically, they're caused by the rise of an extremist right that is prepared to create repeated crises rather than give an inch on its demands. The real question facing America, even in purely fiscal terms, isn’t whether we’ll trim a trillion here or a trillion there from deficits. It is whether the extremists now blocking any kind of responsible policy can be defeated and marginalized. " Read The New York Times, Credibility, Chutzpah And Debt. UPDATE II: "Virtually unnoticed last week was that [another ratings agency] kept a Triple A rating on the United States." Read The New York Times, Moody’s: Why the U.S. Is Still AAA. UPDATE: So much for the inflation fear-mongers. Today the Bank of New York began charging a fee on large deposits. Read the Wall Street Journal, BNY Mellon Deposit Fee: Life in the Liquidity Trap. BTW, a liquidity trap, "in Keynesian economics, is a situation where monetary policy is unable to stimulate an economy, either through lowering interest rates or increasing the money supply. Liquidity traps typically occur when expectations of adverse events (e.g., deflation, insufficient aggregate demand, or civil or international war) make persons with liquid assets unwilling to invest." I guess John Maynard Keynes was right after all. Of course, one 'liberal' commentator has been scoffing at inflation concerns for years. From more than two years ago, read The New York Times, The Big Inflation Scare, where he speculates that "inflation fear-mongering [was] partly political, coming largely from economists who had no problem with deficits caused by tax cuts but suddenly became fiscal scolds when the government started spending money to rescue the economy. And their goal [seemed] to be to bully the Obama administration into abandoning those rescue efforts." I guess that's why that 'liberal' commentator won the 2008 Nobel Memorial Prize in Economics. I wonder what the Hedgehog News prize winning economist would says now. (Warning, that is a satirical comment. Hedgehog News doesn't have any prize winning economist on the payroll. "S&P has triggered another invisible attack by the invisible bond vigilantes." Read The New York Times, What If They Announced A Downgrade And Nobody Cared? 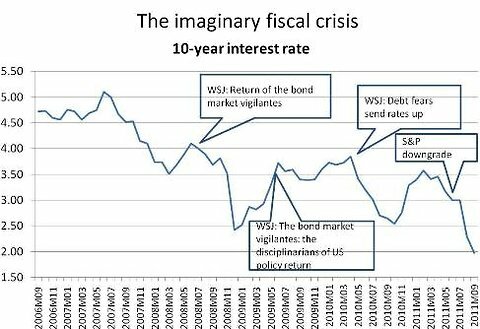 BTW, a bond vigilante "is a bond market investor who protests monetary or fiscal policies they consider inflationary by selling bonds, thus increasing yields." If you don't understand this post, you should refrain from debating fiscal policy issues.